This page is devoted to Purim Shtick done in the various branches- things that were done by hand, or are only funny in context. This page will be photo heavy, so please have patience. This page is divided into branches. If you would like to contribute, please email kesselstreet@hotmail.com. My rule is, if the guy is married, I mention his name, unless I know for sure that he's makpid. For single guys, I leave them out unless I have their explicit reshus- too many guys worried about shidduchim. You'll get an argument from many people if it's still an affiliate. Regardless, they have the zchus of the first shtick picture. 2 leytzanim (whose faces have been edited out, in case they are makpid) turned a doorway into an Absolut bottle. (What year??) One of them is holding an Absolut bottle to help you get it. It's also the only branch, in the true sense of the word. However, this writer has a bias that Eretz Yisroel is also the best affiliate, and don't confuse me with the facts. Eretz Yisroel benefits from avirah d'arah machkimah, along with the fact that Sharfman's is next door, providing ample targets for humor. For the record, this was the affiliate that brought the concept of Purim Mashgiach back from Europe. 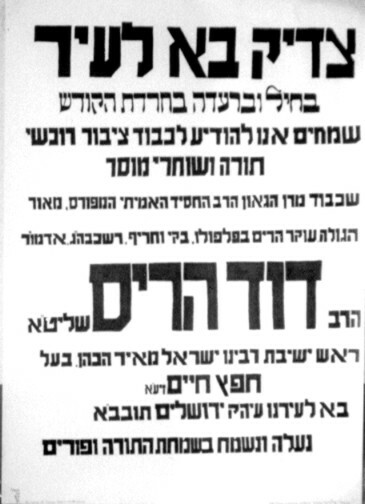 Rabbi Luban was discussing Slabodka at one of his private haskafah vaads he used to give, and Moshe Cheplowitz suggested implementing it in the Yeshiva. 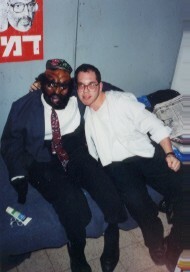 In 1994, I became the first Purim Mashgiach in history. However, it wasn't so pashut. All the Brooklyn guys voted for Benjy Lieberman, who is hilarious but was a first-year guy. Mendel Zlotnick came in third. I got the shtender up front and spoke at the seudah, Mendel got to say a drasha after the play, and Benjy regaled us later with his emulation of the beloved Rabbi Moshe Chait. 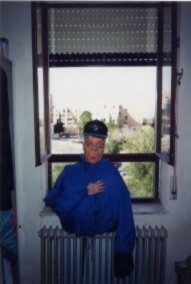 The dummy I had in my room l'kavod Adar. Later the janitor came in and inserted a cigarette into the dummy's mouth. Rabbi Luban would later remove the cigarette, saying "No smoking allowed in the dorms!" Mendel Zlotnick did his own full-body dummy, using a pillowcase for a head. I lent my Mr. T mask to the cause, and Yitzy Schwartz lent his Bukharian yarmulke, and the result was this masterpiece, the picture of which fooled a lot of people into thinking it was real. This is a historic picture of the first ever CC Purim Mashgiach sitting next to the other luminaries of CC Israel, Rabbi Kanarek and Rabbi Moshe Chait. Mendel Zlotnick giving his mussar shmooze about Mother Hubbard and The Little Engine That Could. Benjy Lieberman emulating his favorite Rebbe, Rabbi Moshe Chait. A Historic first Purim Mashgiach lecture of Purim Torah. 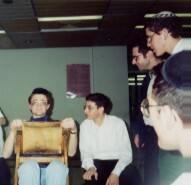 Note for the record: since 1994, other branches have adopted the concept of Purim Mashgiach, including WITS and Miami. The Yeshiva is full of many of these former Purim Mashgiachs, who disappear into the woodwork once they arrive. More on this elsewhere. 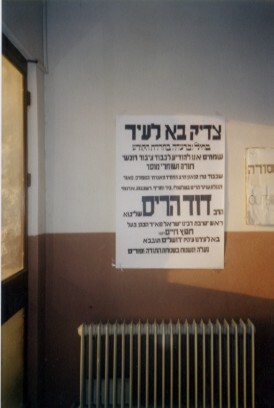 Also in 1994, the guys got together and purchased a large "Hechonu L'bias Hamoshiach" sign. I chipped in, but never got around to taking a picture of it. As soon as I get one I'll post it. Keep in mind that the Rebbe was still alive according to all accounts at this point. A few years later, when the N...NA...NACH thingie caught on, a large H...HE.. (etc) .HENOCH sign was posted on top of the building. 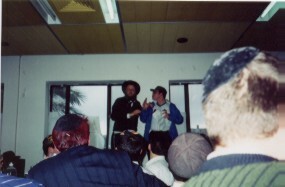 Rabbi Dovid Harris visited Eretz Yisroel for his niece's wedding to Aryeh Winter, close to Purim.(1999?) His former talmidim in Eretz Yisroel decided to give him a hero's welcome- or, in this case, a tzaddik's welcome. 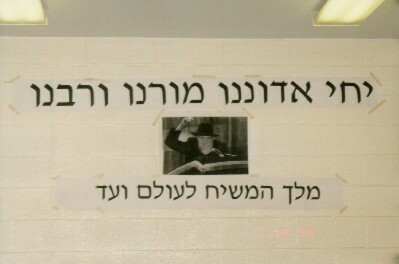 In about 1990 or so, someone went into Sharfman's and hung up the notorious parody of Haneiros Halalu. This hilarious but ribald work falls below the standards I'm setting for this page, and chances are you know it anyways, so I won't describe it further, but I'd like to comment on the phenomenon it launched- a piece of humor so hilarious (a lethal combination of a Yeshivish parody, a rip at Sharfmans, and a bawdy joke) that its existence is widely known, lovingly passed down from older branch Yeshiva guy to younger branch Yeshiva guy, usually late on Friday nights, after the Oneg and a few cold ones. In fact, you can go over to almost any older kollel guy, say "Hanaa'aros halalu kodesh hein", and watch him either chuckle, smile, or valiantly attempt to hide a smile. Good shtick can happen in WITS. The freezing cold winters give everyone cabin fever, and many people compensate with beer. 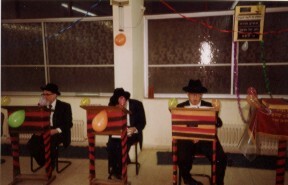 Regardless, it means that people have to vent on Purim.I've seen many good WITS pix, but none are on hand currently. Brooklyn is its own unique branch. Reviled by students of the other branches for reasons both justified and not, Brooklyn is full of Yeshivish and non-Yeshivish Brooklynites. It currently suffers from a miniscule Beis Midrash, and the Hanhala there compensate by calling anything above 9th Grade a Branch Blatt Shiur. Regardless, has its share of yeshivish guys with a sense of humor. This is the work of the Class of '98. Rabbi Turk, turned into Moshiach. 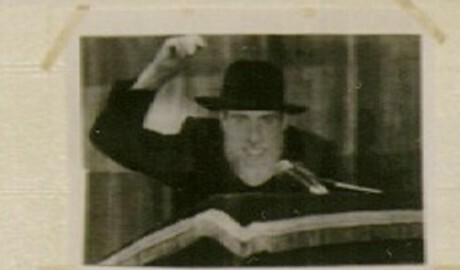 Large version of Rabbi Turk. Their version of H.HE..HEN...Rabbi Jacobson gets his share of the fun. 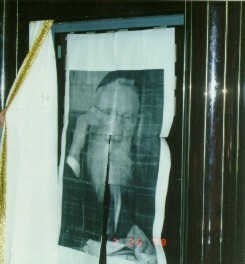 They put a large photo of the Rosh Hayeshiva Shlit"a on the Aron Hakodesh. Or at least that's what the WITS guys like to say- "In Miami they party, at WITS we learn". They party in WITS too, and they learn in Miami too. But they definitely have more fun in Miami. For now, Miami wears the crown of being the "in" branch. Unlike my early blatt shiur days, people don't have to be klopped on the head and whisked to Miami- they go there of their own accord. Miami also wears the crown of the Most Famous Shtick. In 1996, they decided to do some traditional shtick- a "Haman" effigy to be hanged publicly. A lady passed by the Yeshiva, saw the effigy, and thought the guy was real. At 7:00 in the morning, a bunch of emergency personnel, cops, and reporters descended on the Yeshiva at 7:00 in the morning. A sheepish Rabbi Grunblatt explained what happened to the cops and reporters what had happened, and the incident was broadcast on the evening news on TV. (The 1990 shtick in Israel never made the news, and we don't officially acknowledge its existence on this page anyway).